My name is Antoinette Moncrieff, and I am from Ypsilanti, Michigan. 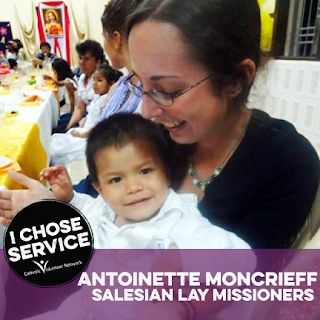 I am 27 years old and I served September 2013 – August 2014 as a Salesian Lay Missioner at Hogar Sagrado Corazon, a girls’ orphanage in Montero, Bolivia. I suppose I am a bit of a rogue since I chose a year of service in the midst of college, rather than waiting until I graduated! At the time I went to Bolivia, I was sort of in between majors and both feeling disillusioned about higher education and burning to make a positive difference in the world. I considered the Jesuit Volunteer Corps as well as the Vincentian Volunteer Corps, but ultimately I went with the SLMs because of their special focus on children. I have always loved children! The calling I felt to international service work was itself rooted in children; I distinctly remember sitting in my physics class, wishing I could be doing something else with my life, and feeling a strong desire to go love the children who had no one to love them. My boyfriend at the time had done a year in the Amazon with the SLM’s, so I was somewhat familiar with the organization. My time in Bolivia was one of the rawest, most pivotal periods of my life. The girls I worked with were a special group of children. Bolivia does not have a foster system and so the children who live in orphanages are not only kids who are missing parents but also kids who are there for all the same reasons that kids might be in foster care in the United States; these included poverty as well as having been removed from the home by the Bolivian equivalent of Child Protective Services for all sorts of abuse, abandonment and neglect. I learned nine months into my volunteer period that our Hogar was a sort of last – chance asylum for all the kids that other orphanages didn’t know how to handle. Some of the real challenges we faced included sexual abuse within the Hogar itself as young survivors attempted to process the abuse they had experienced through exploiting younger kids. Stealing from staff and fellow children was a common occurrence; they definitely broke into my room several times before the lock was fixed! While at the Hogar, I saw and experienced hunger and poverty firsthand. Breakfast and dinner were often a piece of bread; we tended to fare better at lunch, which was usually a mixture of meat scraps, vegetables and rice, but once went a whole week where all we had for lunch too was a bowl of soup apiece. Despite all these challenges, my time in Bolivia was still full of joy. I saw many small miracles, every day. I experienced firsthand on a daily basis how far a little bit of love and a safe place can go in the life of a child. I watched a very sick and depressed little girl, who had spent her early childhood years wandering the streets with her schizophrenic mother, blossom under my care into a joyful little person able to talk to her peers and name the colors of her crayons. I watched a frail little toddler whose back had been injured when her mentally ill parents threw her against the wall as an infant learn to walk and begin to thrive in my care. I helped nurse a sorry little street cat who was covered in scabies back to health and reaped the benefits when she gave birth to four delightful little kittens on top of me in my bed in the middle of the night! I was present when two of my little ones were adopted by lovely Dutch families and am able to see Facebook pictures of one of them on a regular basis. I saw two more of my little ones go to loving Bolivian families. I received constant little acts of kindness from the most ordinary people: a moto taxi driver, a nurse, a father whose little one was also in the hospital, a little girl selling bread in the market. I was surrounded by beauty, both from the rich and vibrant colors of the trees, sky, flowers, buildings and animals and from the smiles I encountered every day in the little people I cared for. I ended up graduating a few years after I came home, earning a Bachelor of Arts in Individualized Studies with a concentration in Elementary Education, Spanish and Women’s and Gender Studies from Eastern Michigan University in 2016. I am now working in an early childhood center and pursuing a career in Direct Entry Midwifery. I can honestly say that my time in Bolivia had a profound impact on many areas of my life. On a humorous note, I am now an expert in identifying and removing lice, navigating long-distance relationships over patchy internet access, washing clothes by hand and changing diapers with toilet paper instead of wipes. I am known for my flexibility, resourcefulness, creativity and adaptability! On a deeper note, Bolivia for me was the catalyst for many personal questions about life, the meaning of life, faith, poverty, Western colonialism, gender inequalities, sexuality and my own past. My faith was severely challenged by the heartbreaking conditions I was living and working in, yet strengthened by the resilience I found in both the children and myself. I witnessed firsthand a lot of hypocrisy and abuse at the hands of Church representatives and the questions I brought home with me both changed the way in which family and friends looked at me and changed the way in which I looked at the world. But I think that the questions Bolivia raised for me were ultimately good ones which have opened the door for new life and personal growth, enabling me to serve the world around me in a unique way. I am truly grateful for the time I spent there and for the brief opportunity I had to share the lives of so many beautiful children. Every morning when I wake up I see twenty of their little faces smiling back at me from a large frame on my bedroom wall and I know that I really did make a difference in their lives. My advice for someone considering post-graduate service? Follow your heart! Listen to what your gut is telling you, even if it doesn’t always make sense to others. And if your heart is telling you to go serve in the middle of your schooling? Go for it! Don’t be afraid! Embrace your calling to serve and open your heart. I can promise you it will be broken and mended a thousand times, and it will be worth it. The world will change you, but you will also change the world! Wherever you go, and whatever you do, if you follow your heart, you can’t go wrong! I wish you all the best! To learn more about faith-based service opportunities, check out our RESPONSE directory, listing thousands of opportunities across the United States and abroad.